Directing the Choral Music Program is a comprehensive introduction to developing and managing choral music programs from elementary through high-school and adult levels. Designed primarily as a choral methods text for the undergraduate music education curriculum, it is also useful for choral directors in schools, churches, and communities. Broad in scope and practical in orientation, the book is structured around three basic units: the administrative process, rehearsal and performance planning, and choral techniques. In addition to core topics--including recruitment and auditioning, classroom management, vocal development, and curriculum and performance planning--it features many subjects not covered in other texts, such as student discipline, philosophy of choral music education, and the history of choral conducting. The author also presents material on directing show choirs and musicals; organizing choir tours, festivals, and contests; working with adolescent singers; and teaching sight-reading skills. 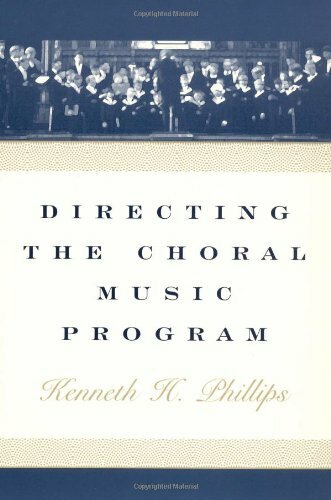 Directing the Choral Music Program incorporates study and discussion questions at the end of each chapter, numerous illustrations and musical examples, and a variety of class projects throughout. The appendixes offer helpful lists of music publishers and distributors; manufacturers of equipment, supplies, and attire; recommended choral repertory; voice class resources; and sight-singing materials. Grounded in the author's extensive experience in directing choirs at all levels, this book combines practical methods with a research base, providing readers with a solid foundation for a career in choral directing.